What are the common installation methods for LED displays? 1. Mosaic installation: In indoors, suitable for small indoor screens. 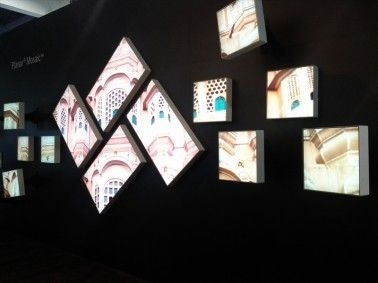 Since the installation space is small, in order not to occupy the space, the same size area is dug on the wall according to the size of the screen body, and the LED display screen is embedded in the wall. The wall is required to be a solid wall. The method of pre-maintenance is high costly. For outdoor installation, the mounting structure is suitable for the display project that has been included in the planning and design of the building. The installation space of the display screen is reserved in advance when the civil engineering project is constructed. In actual installation, only the display steel structure is required to be made when installing LED display Inlaid in the wall of the building, there is enough maintenance space on the back. 2. Wall-mounted installation: It is suitable for indoor LED display installation. The area is small (10 square meters or less). The wall requirements are solid walls. Hollow bricks or simple partition walls are not suitable for this installation method. 3. Hanging installation: It is suitable for large-scale places such as station LED electronic display and airport LED electronic display to play the role of indicating signs. The screen area is required to be small. (10 square meters or less) requires a suitable installation location, such as a beam or lintel at the top, and the LED screen is usually covered with a back cover. Ordinary mounting is suitable for single cabinet display with total screen weight less than 50kg. It can be hung directly on the load-bearing wall without the need to reserve maintenance space. The LED display cabinet is designed with front maintenance. When the maintenance is performed, the display will be opened from the bottom. The rack mount is suitable for the general outdoor display. Considering the difficulty of the display maintenance, the steel structure is supported between the screen body and the wall surface, and the maintenance space of 800mm is reserved. The space is equipped with maintenance facilities such as horse tracks and ladders. And install auxiliary equipment such as power distribution cabinets, air conditioners, axial fans, and lighting. 4. Column type installation: It is mostly used for the installation of LED electronic display screens for outdoor advertising. It has a wide view and relatively empty places, such as squares and parking lots. According to the size of the screen body, it can be divided into single column and double column type. The column mount is suitable for the installation of the LED display on the open space, and the outdoor screen is mounted on the column. In addition to the production of the screen steel structure, the column type also needs to make concrete or steel columns, mainly considering the geological conditions of the foundation. 5. Roof-mounted installation: It is mainly suitable for outdoor advertising LED display. The installation location is mainly the roof of the building. As the height of the building increases, the windproof level to be considered also increases. 6. The seat structure is a concrete structure on the ground to build a wall sufficient to support the entire LED display screen. The steel structure is installed on the wall to install the LED display screen. The steel structure is reserved for 800mm maintenance space, and the related equipment and maintenance facilities are placed.